Patent-Pending Technology - UK Patent Application No. 1616129.1 - ISOLATE comes complete with Extra Small, Small and Medium EARFOAMS and a Flare carry pouch. - Replacement EARFOAMS are available separately in packs of three pairs on Amazon - EARFOAMS Extra Small = 9mm diameter, EARFOAMS Small = 11mm diameter - EARFOAMS Medium = 13mm diameter. - Quotes from famous users: "FLARE is a fairly new name in the Audio world. In the space of two months I have used two of their very unique products. The Isolate Ear Protectors are the best ear plugs I've ever used, great for air travel and very loud concerts!" - Tony Visconti (Producer - David Bowie, Kaiser Chiefs, Iggy Pop). - "These are bl**** genius! LONG LIVE EARS... #besmart" Glen Rowe: Tour Director Muse. - "I'm wearing the ISOLATE ear protectors now. They're bl**** incredible! Perfect for the tour bus / flights. You guys have filled a hole in the market!" Peredur Ap Gwynedd: Guitarist Pendulum / Faithless. 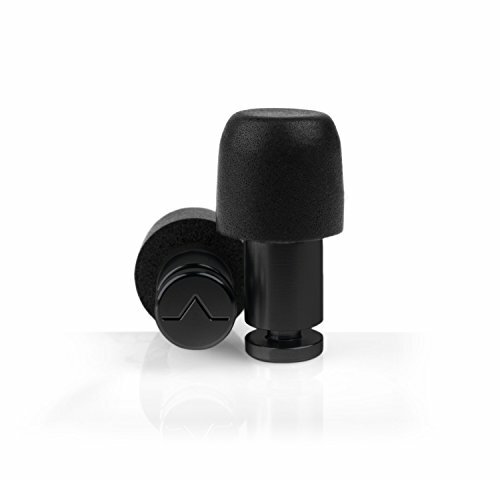 ISOLATE MINI: A REVOLUTIONARY EAR PLUG MADE FROM AEROSPACE ALUMINIUM. Block irritating noises and get peace and quiet anywhere. ISOLATE MiNi OFFERS PERFECT PROTECTION FOR: Sleeping, Travelling, Motorcycling and Motorsports. Enjoying loud music safely at concerts, blocking out office noise and anywhere where you want to turn the world down. INCLUDED WITH EVERY SET OF ISOLATE MiNi EAR PROTECTORS: Replaceable Earfoams (3 Pairs in 3 sizes are included), Isolate mesh carry pouch. HOW DO THEY WORK? Traditional foam or plastic ear protectors try to absorb sound which allows low frequencies to enter your ears and creates mud/muffle on your ear drums - Isolate reduces sound including low frequencies in a very level way enabling an improved music experience and peace and quiet from other loud and irritating noises. If you have any questions about this product by FLARE, contact us by completing and submitting the form below. If you are looking for a specif part number, please include it with your message.